It’s been more than five years since we reviewed Zoho Sites, a web publishing solution developed by Zoho Corporation in 2012. With the launch of this builder, the company filled a much-needed gap in Zoho’s business apps lineup. The new product integrated with other business tools in Zoho’s productivity suite. For example, Zoho stores all content in the Zoho Creator Database and offers the CRM Form Builder which lets users handle such things like support requests. Initially, the builder followed the freemium model; there used to be two plans: a free and Premium. In September 2014, the company decided to make the builder completely free. They simply cut their advertising costs and left marketing to the end user. But since 2017 paid plans have appeared again, but the free pack is still alive. The Zoho Sites team believes that the best way to spend their marketing budget is to invest into new features. So, currently, the builder has a free plan which means we can easily sign up and see how it works. 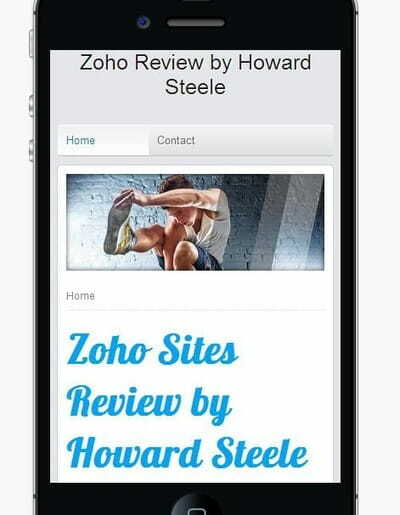 Join us reviewing Zoho Sites website builder. The builder is really pleasant to use. It’s clean, intuitive and easy-to-navigate. Once you’ve signed up, you’ll be taken to the library of templates. Then, you’ll be redirected to the builder itself. Zoho Sites is a typical drag-and-drop website builder: in order to add a widget or website element to the page, simply select it in the top toolbar and drag the chosen object to the canvas. Each element includes additional customization options. 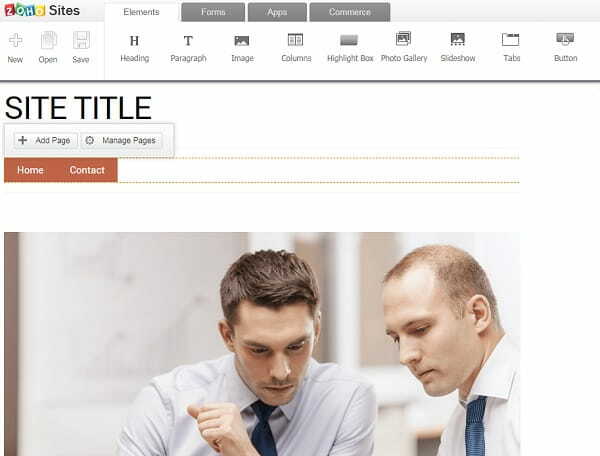 If you want to go beyond what is available in their drag-and-drop toolbar, you can make use of the HTML/CSS editor. All in all, it looks very well organized. Page versions. The system maintains the database of edited pages so you can get back to and republish your previous page versions anytime. Mobile view. Every website is automatically optimized for mobile viewing. You can edit your site’s mobile look via the HTML/CSS editor. Pages without navigation (landing pages). Custom 404 pages and more. What I like most about some of the business features like their CRM forms, for example, is the extensive degree of customization. Other website builders often provide something more watered-down. All Zoho templates are sorted by industry. This is very convenient when you need to create a niche-specific website. But the truth is that those templates look very outdated comparing with uKit or Wix themes. It looks as Zoho didn’t change them since 2012. Sure, there is a separate section called ‘Responsive’ where you can select a template which looks pretty nice both on desktop and mobile. But the number of those responsive is just 17, that’s a few. I think their library could be more diverse. The good news is that you can swap templates anytime without losing your content. For beginners, they offer a visual editor, and for advanced users there’s a built-in HTML/CSS editor. In case you face an urgent problem, you can reach one of their experts via email directly through the control panel. Zoho offers a good deal in the market: its basic version is absolutely free. But you should know that using your free account you can’t attach your own domain and remove Zoho Sites advert from the footer. By subscribing to one of three paid plans you can can remove ad, so no one will ever guess you’re using a website builder. Other paid features include: unlimited pages, galleries and slideshows; blog; themes; mobile site; comment box; highlight box and more. Zoho Sites platform comes as one of the products developed by Zoho Corporation. Their other products include, but are not limited to BugTrackers, Custom Apps Creators, LiveDesks, Invoices, Reports and Surveys. As I see it, this smorgasbord of software lets the company keep their site builder with so affordable fees. The theme library is a bit outdated. The eCommerce solution is very basic as it allows to sell only 25 products. Zoho Sites is good and risk-free website builder. Using its free version, you can create and publish a website, but you couldn’t connect your own domain name. In other words, you can get a simple website up and running for the price of your domain name. There are also paid plans ($5-15/month). In my opinion, Zoho Sites is a good place to try your skills, regardless of your webmaster level, as it offers both WYSIWYG and HTML/CSS editors. Zoho Sites isn’t the best option for those who are looking to create a fully-featured web store or really complex website with custom functionality. Zoho Sites user? Tell us your story in the comments!